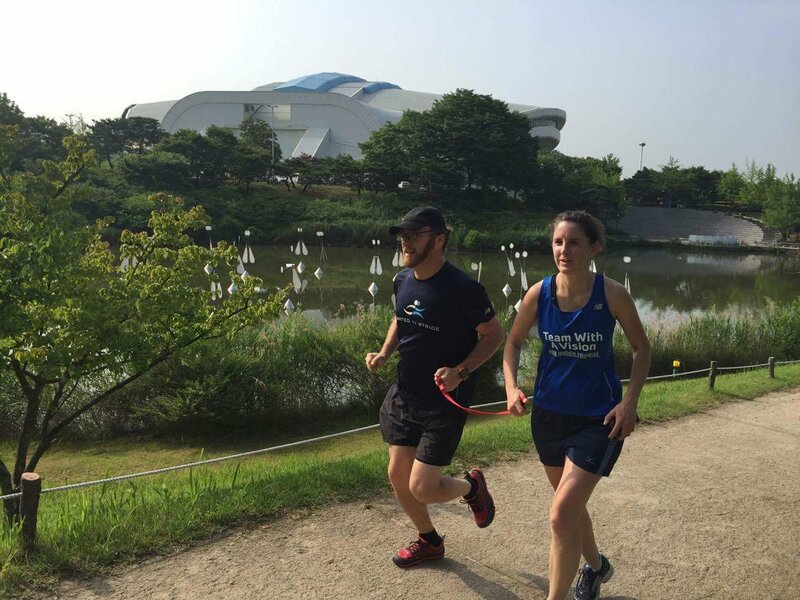 Recently my coworker Kyle Robidoux invited me on a trip of a lifetime: to head to Seoul, Korea, for a few days and assist in presenting at the K-Sports Foundation’s inaugural 2016 International Guiderunner Conference. 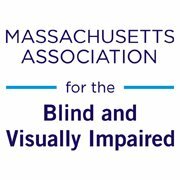 There, we would talk about how we at the Massachusetts Association for the Blind and Visually Impaired (MABVI) manage our robust volunteer guide services, including MABVI’s 1:1 Volunteer Program; United in Stride, our online guide matching resource; and Team With A Vision, our running team made up of athletes who are blind and visually impaired, their sighted guides, and supporters. To date I have been in three plays, all of them after losing my eyesight. The first play I had a leading role; the next play, three smaller parts; and for the third, Night of the Living Dead, I was only in a couple of pre-recorded video shoots. I guess I’m going downhill, and the next step will probably be – oh no, director! For the Night of the Living Dead I was one of the zombies. A few days before my Ironman in Wisconsin, the director of the play, Tim, assembled all of us zombies for a little walking dead training. Tim gave a number of visual examples of how to “walk like a zombie.” Well, since they were visual, of course, they didn’t exactly work for me. Like most avid marathon runners, I’ve always dreamed of running the most prestigious marathon race in the world: the Boston Marathon. I first qualified when I was a medical student nearly 11 years ago, but was afraid of requesting time off from my third-year clinical rotations to run it. For the following 10 years I’ve always regretted never asking. Since joining Kaiser Permanente, an institution that values an employee’s health and well-being via a strong work-life balance, I’ve been able to achieve qualifying for the Boston Marathon again. Ten years later, in 2014, I ran the post-bombing marathon in a personal record time and shared in showing the world how a terrorist act would never dissuade the spirit of our running community. 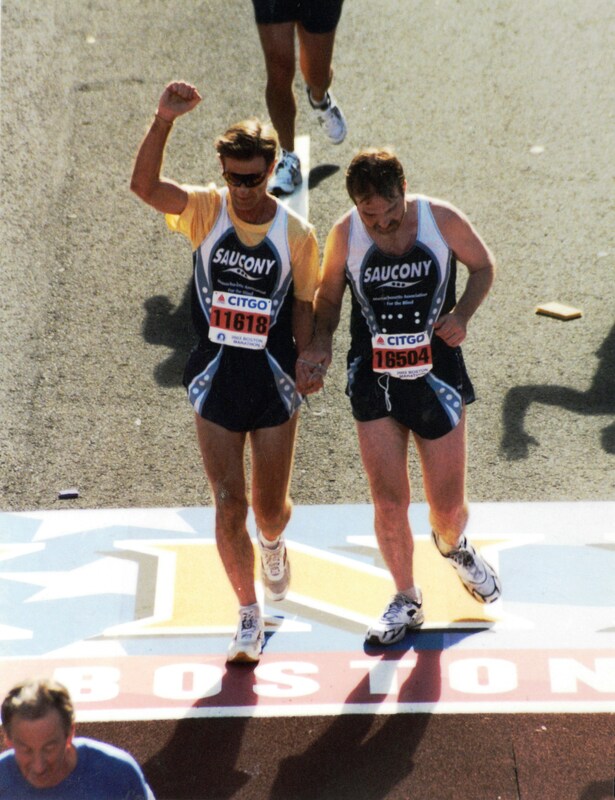 Ed Rutkowski, runner 11618 on the left wearing sunglasses and fist-pumping, and Tim Paul, runner 16504, cross the finish line of the 2003 Boston Marathon. 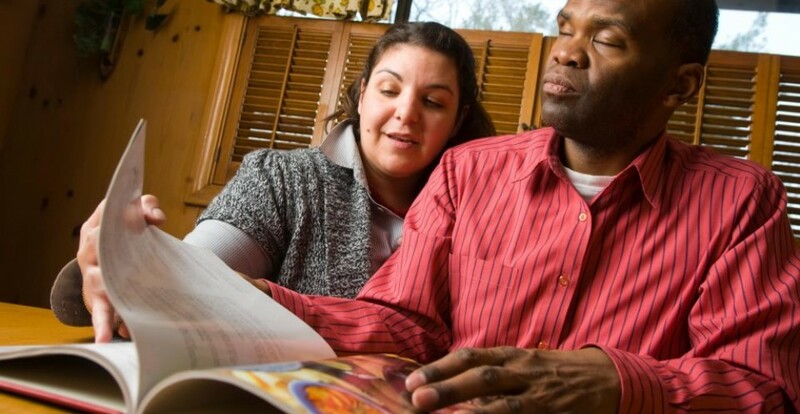 This post was written by Ed Rutkowski, a 2003 sighted guide on Team With A Vision. For me, running a marathon was an improbable undertaking. 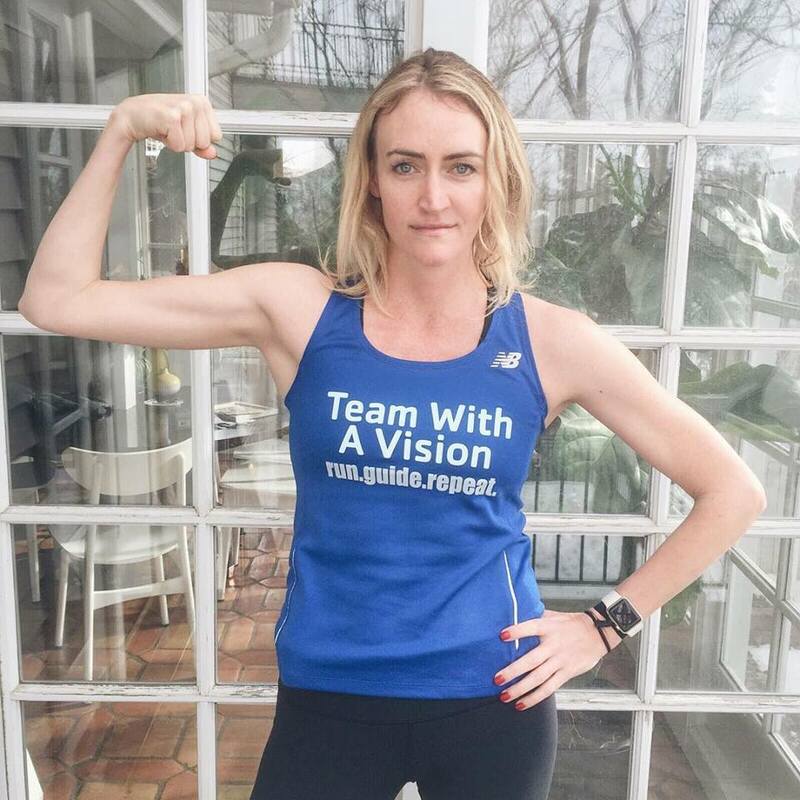 I didn’t expect I’d be running the Boston Marathon, much less after getting knee surgery and experiencing some vision loss. However, I eventually became a running guide for Team With A Vision in 2003. 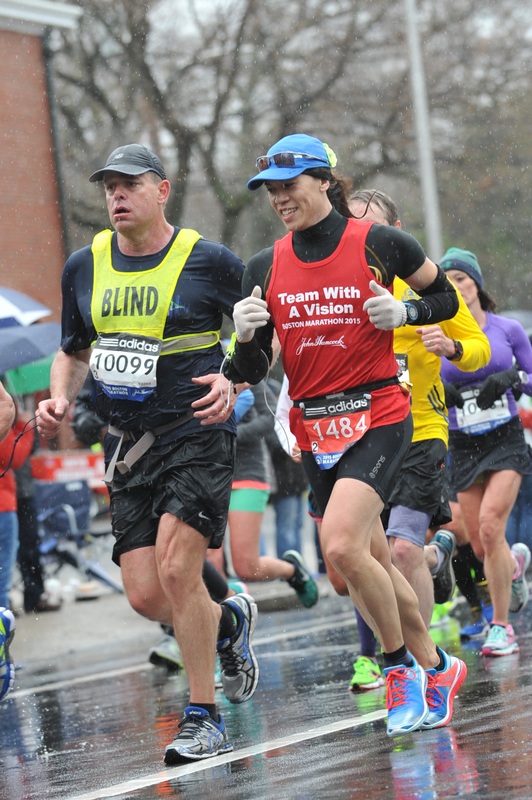 I had already run the Boston Marathon when I came across a short newspaper article about Barbara Lischinsky, a blind woman who was running the marathon as part of Team With A Vision. Having undergoing retina repairs and cataract surgery in both eyes, I decided I would direct my running efforts at charities like MABVI. This inspired my Boston qualification run at Disney in January 2003, after which I received an invitation to be a running guide. Even more special, I learned that my partner would be Tim Paul, a 1976 graduate of Lyons Township High School in Illionis where I had graduated 10 years before! I first met Tim on the Saturday before the race. We looped the shoestring between our fingers and went on a five-mile run. Although this was my very first experience as a guide, Tim and I immediately fell into an easy rhythm and I quickly learned how to use the tether for direction— slack for left and tension for right. I have no explanation as to why guiding Tim with that simple shoestring, which I had never been introduced to until that first day, became almost immediately second nature to me. I had few expectations, other than knowing that it would be Tim’s race and that I was there simply to facilitate it being the best race he could run. Tim adjusted to the course and his fatigue and then I adjusted to Tim. From that run, I recognized that finishing would be a challenge for Tim and me, but he seemed very confident and determined. While I was constantly talking and encouraging Tim throughout the race, he said only one sentence to me over those final miles: “Only wimps walk.” Indeed I guided Tim around numerous walkers. Tim was pleased with his time at Boston. And, for me, that was all that counted. The day after the race, I had breakfast with Tim and four other visually impaired folks at the Sonesta Hotel in Cambridge where we stayed. That breakfast that was almost as memorable as the race itself. I was the only sighted individual at the table, so I read off the menu. Having two young daughters, that was not the first time I had done this, but I never had to repeat a thing. Everyone ordered from my first reading. Tim, who sat next to me, dropped his fork during the meal. I got up and retrieved a clean one from another table and told everyone what I was doing. A few minutes later, Tim dropped his folk again. I got up, retrieved another fork and told Tim that if he dropped this one that he was going to have to get on the floor and find it himself. That brought out a big laugh from everyone, including Tim. Before that weekend, I would have never thought to joke with a blind person like that. 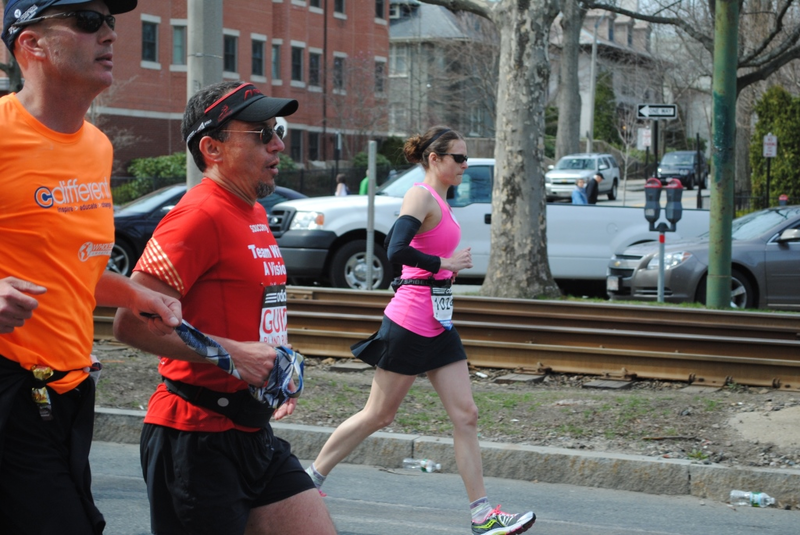 That marathon was the slowest of five Boston runs, but it was also the most rewarding. My years of running have ended, but my memories of TWAV will last forever. Indeed TWAV proved itself to be Boston Strong well before it became a universal saying. 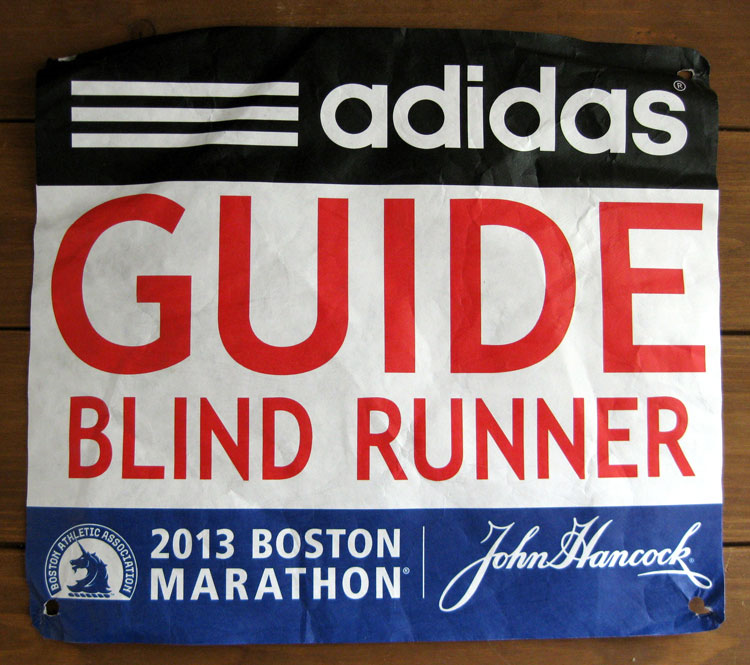 I ran as the guide for visually-impaired runner Mike. Mike’s sight is limited to a narrow window directly ahead of him, a condition called retinitis pigmentosa. We ran tethered together, holding on to opposite ends of a necktie Mike had borrowed for the occasion. We spent the first mile slowly picking our way through the thick crowds while we worked out the details. The tether worked better if there wasn’t a lot of slack, so we ran side-by-side with less than a foot between us. That meant we bumped arms frequently, but the contact helped us keep track of each other’s location. Once we had a little room, Mike starting turning in sub-9 minute miles, well under the 9:40s he’d need to finish at his stated goal of 4:15. 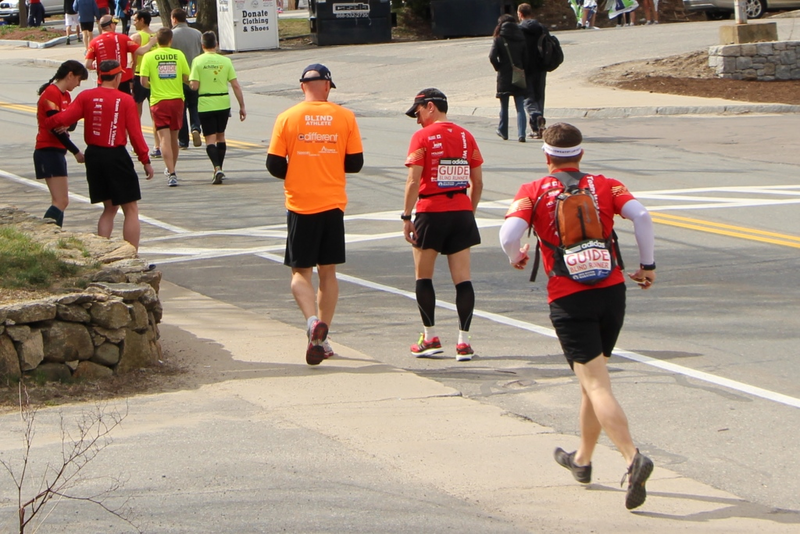 We were passing people more often than we were being passed, so I was constantly scanning the runners ahead of us, looking for spaces wide enough for two people to fit through. When I saw something, I’d call out the direction and either tug on the tie or give Mike’s arm a nudge. When we were lined up properly, I’d say okay, give the opposite signal to stop our sideways motion, and we’d move through the gap. As we got more comfortable running together, we got a little more aggressive. Sometimes Mike would see a gap ahead of him and he’d go for it, but since his field of vision was narrow, he wouldn’t realize that the gap wasn’t quite wide enough for the two of us. There were a few times I had to hold him back, but for the most part I just fell into line behind him until we made it through. Then I’d accelerate to get back to his side. Once I realized Mike wanted to go for it, I started leading him through those gaps, darting into his field of vision and calling, “Follow me!” We’d shoot through, I’d slow down for a few steps so he could get back to my side, and then I’d start looking for the next gap. Mike only had two collisions, both early in the race when runners directly ahead of us decided to stop suddenly. The first person was just oblivious (and wearing headphones), while the second had stopped to pick up a sweatband that another runner had discarded. In both cases Mike let me know he was okay and we got right back on track. It was a warm spring day, and it got warmer as the race went on. By the time we reached Wellesley, I was sweating profusely and I had to throw water in my face to rinse the salt out of my eyes. Even Mike, used to the warmer weather in Texas, was getting a little too hot. Luckily, a cool sea breeze started to provide some relief as we approached the Newton hills. 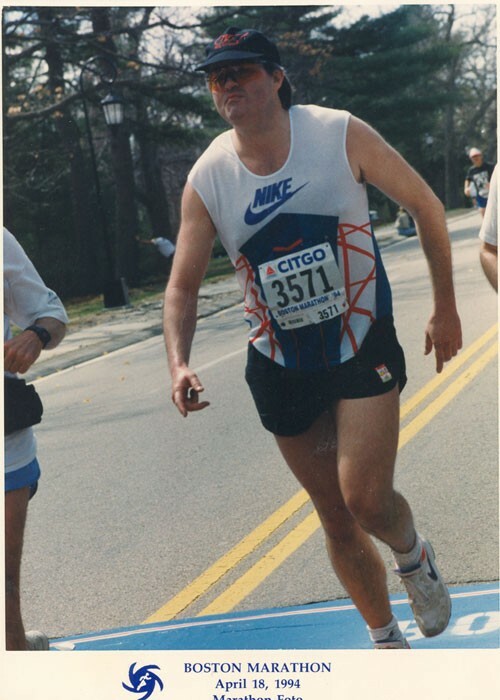 All of Mike’s previous marathons were on flat courses, so the series of four hills in Newton between mile 17 and 21 would be a big challenge for him. We rolled up the first two hills, passed the Johnny Kelly statue, and climbed the third hill. When we reached the top, I told Mike that the worst of it was over. Then we hit Heartbreak, which looked to Mike, “like a wall of people on a giant escalator.” Halfway up he was struggling, but he had enough breath to complain that I’d said this would be “just a bump.” I cheerfully admitted that I might have lied. Once he crested Heartbreak, Mike sped up again, determined to finish strong. Whenever there was some space, he’d jump ahead, forcing me to accelerate to catch up. I was starting to get tired. 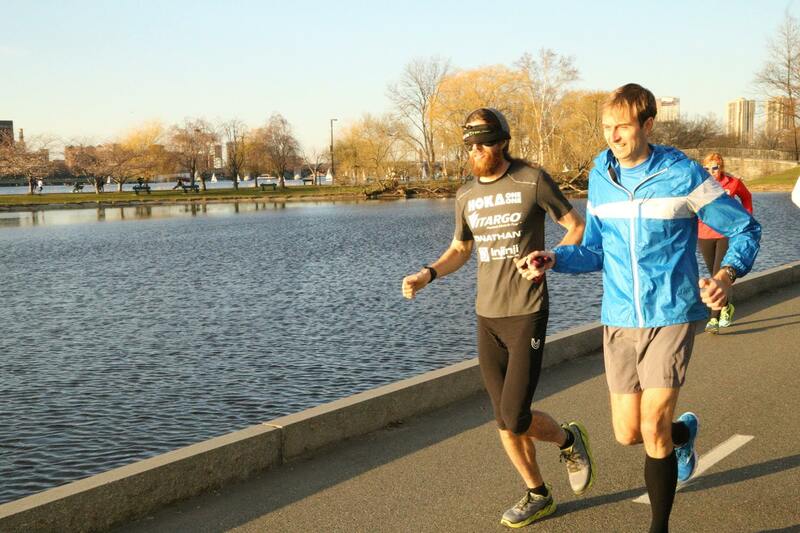 Each time I had to break into a run to chase Mike down, in the back of my mind I wondered if I could do it. Happily, I answered the call every time. As we zoomed along, we caught up with a slower woman runner so quickly that I didn’t have time to decide whether to go to the left or to the right. Instead, I shouted, “Up!” By this time we were working so well together that we both instantly raised our arms, split, and went around her on either side, our arms still connected by the necktie passing cleanly over her head. As Mike noted later, it was a good thing she was short. I was furiously doing math in my head as we ran. At mile 24. I realized that if we were able to finish strong, we might just sneak in in under four hours. Mike somehow increased his effort to meet the challenge. 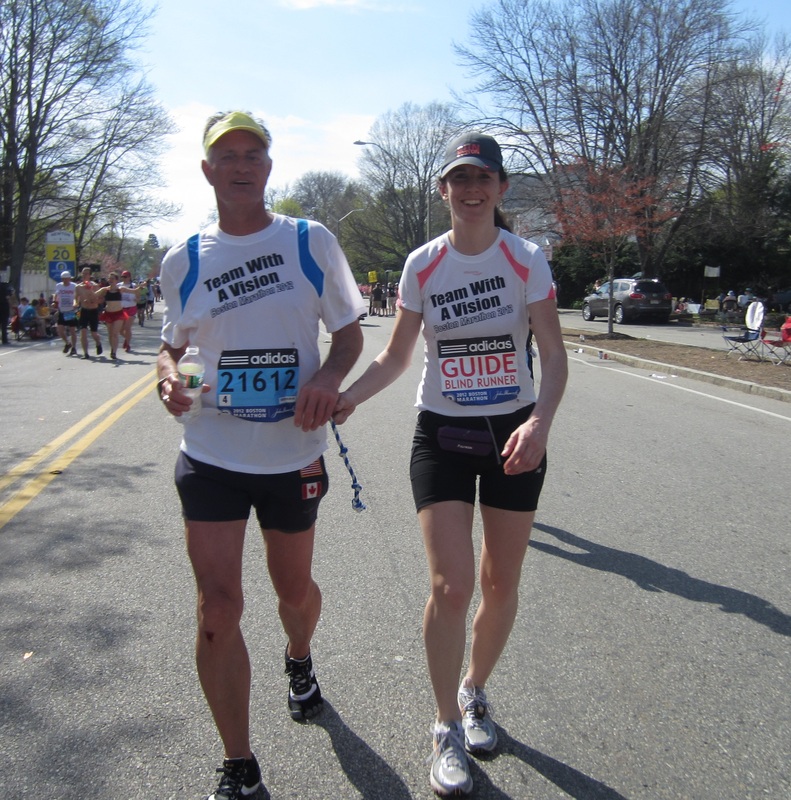 Then we turned right on Hereford, left on Boylston, and Mike sensed the finish. He found a clear path down the middle of the road and charged for the line with me running alongside, struggling to keep up. Unfortunately, the reason there was a clear path was because there was a large group of cameramen in the center of the road. Most runners went to one side or the other to avoid them but Mike crashed right through with me trailing behind, thankful that we didn’t hit anything. Mike crossed the line with a chip time of 3:58:47, placing him 11th in the Visually Impaired division. Ray Charbonneau is the editor of The 27th Mile. The complete version of this article is included there, along with works from Amby Burfoot, Lawrence Block, Kathrine Switzer, and more runners who write. 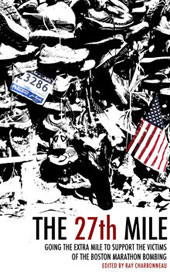 Proceeds from sales of The 27th Mile go to benefit The One Fund Boston. For more information, visit the27thmile.com.